Yesterday Ben and Ken and I went shopping. We started off in the basement of Buffalo to get some sale shirts. There were a couple of oversized couches facing each other. On each sat a large male mannequin (grey-tone skin) in jeans and a t-shirt, legs crossed, hands on thighs, leaning in, heads tilted, as if in conversation. Ben immediately went and sat beside one and shook his hand. Ken sat with the other. I did a quick walk of the floor and pulled some shirts I thought the boys might like. When I came back, Ben had a mischievous grin on his face. "Where did you get that hat?" I said, noting he was wearing a royal blue baseball cap. Ben raised his eyebrows and pointed emphatically at the mannequin's head. It was now wearing Ben's brown fedora. Ken and his mannequin had also made the switch. On the way out Ben tried to give a female mannequin his ring. He insisted that she wanted it. The boys agreed to wait on a bench while I went into Pink. As I came out, they were bounding toward me, big grins on their faces. "Ben wants to go to Rocky Mountain Chocolate," Kenold said. "He found it on the information directory." Ben nodded and signed "chocolate." I knew there was a chocolate place downstairs that D'Arcy and Ben had frequented. So down we went. The store had shelves and shelves of little custom-made chocolates laid out. What was Ben going to choose? 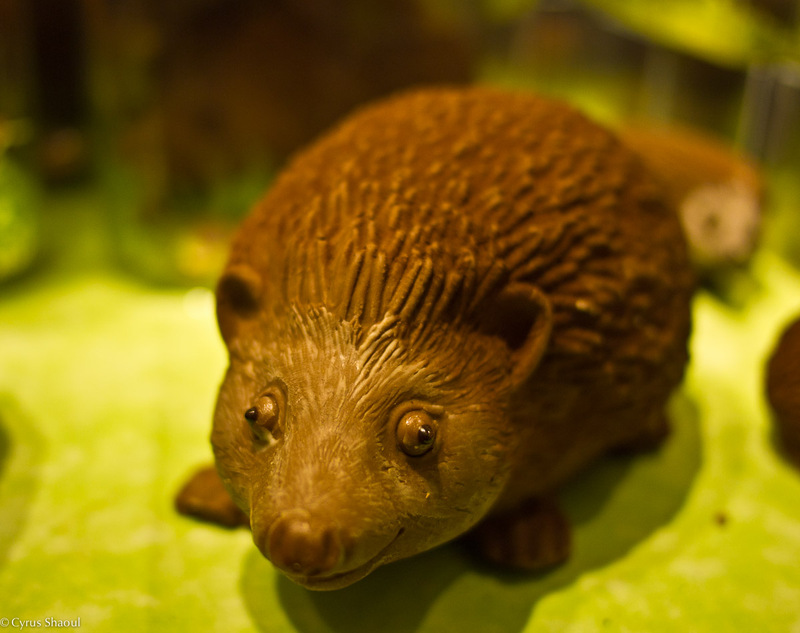 He scanned the shelves, quickly zooming in on his target: a chocolate hedgehog (as above). I have no doubt Ben had a hedgehog on his last visit. Kenold chose a white one. The boys ate their chocolate at the fountain, while I went into American Eagle. When I came out Ben was eagerly gesturing that he wanted to throw his ring in the fountain. I convinced him he could throw a quarter. Water had splashed all over the ground and he was wearing his new black converse (note to self: not a good shoe for orthotics) with a huge lift on the bottom of the left shoe. I was concerned he'd go flying, so Ken and I held him as he threw the quarter in. It took him a couple of seconds to coordinate his arm, but he let it rip with great flourish. "Toys" he signed, gesturing to a Toys Toys Toys store down the hall. The boys went ahead to the Toy store while I grabbed a coffee. When we met up Ben was holding a Justice League package with a listing of all of the characters on the back. A sales associate unsuccessfully searched the walls for the gold character he wanted (I couldn't read its name because I didn't have my glasses). We left with a sale item of 3 characters for $4.99. That night as we ate at an Indian restaurant, Kenold told his sister that Ben had wanted to throw his ring in the fountain. I had asked Ben where he got the ring, which looked somewhat unisex with an illustration under a small circular glass on top. "That's my ring! S gave it to me for my birthday. I've been looking for it everywhere." She had no doubt taken it off at one of the computers, where Ben had found it. Oh ... and I'm glad your daughter's ring was spared! :) haha! Isn't a person more than a brain? Content in BLOOM is not a substitute for professional medical advice. Always consult your doctor. Views expressed in posts and resources listed do not signify endorsement by Holland Bloorview Kids Rehabilitation Hospital. The BLOOM blog welcomes comments from readers on issues that affect parents of children with disabilities. We moderate comments to ensure they’re on-topic and respectful. We don’t post comments that attack people or organizations. Copyright © Holland Bloorview Kids Rehabilitation Hospital. 2014. All Rights Reserved.